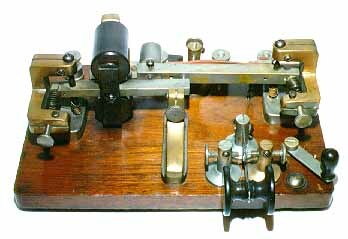 Gil Schlehman - K9WDY has been collecting telegraph keys for many years. He specializes in bugs and has over 250 DIFFERENT bugs in his collection along with many fine examples of early land line and wireless keys. He is always interested in helping people with the history, operation, classification and value of early and unusual telegraph keys. He is an expert appraiser and the most knowledgeable person in the field. 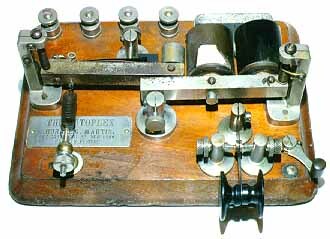 Click BACK or go to http://w1tp.com to go to the main Telegraph Museum Pages. 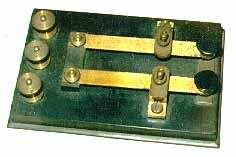 The Vertical Vibroplex is one of the rarest and most "collectible" of keys. Gil has several, including a left-handed model. A second view of the Vertical Vibroplex. A third view of the Vertical Vibroplex. A VERY RARE Martin Autoplex ! A VERY Rare Wood-based 1902 Autoplex ! As soon as Gil began setting up his "tailgate" show at the 1995 Antique Wireless Association Convention in Rochester, NY, eager collectors ran over to see his display. Gil's tailgate" show at the 1995 Antique Wireless Association Convention in Rochester, NY. The Bunnell Miniature Key and Sounder is another very rare item. Both the key and the sounder are fully functional. The Two-Lever, All Wooden Cricket is so rare that most serious collectors have never even seen one. This is a fine example. Mid 1920's bug made by the Precision Thermometer and Instrument Co. in Philadelphia. The mechanism may be rotated to permit right or left-handed bug operation or use as a straight key. Circa mid 1920s. This exceptionally desirable and hard to find bug makes both dots and dashes automatically. It was made by Mel Hanson in California, in 1939. This cable key shows some resemblance to the "Cutriss" cable key.